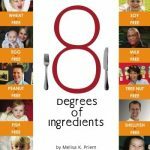 The following recipe has been reprinted with the permission of the author of 8 Degrees of Ingredients, Melisa K. Priem. Veal Marsala is a simple, yet elegant entree that can be made in a matter of minutes. Veal cutlets are a wonderful staple to maintain in your freezer as they thaw rather quickly. This recipe was shared by Melisa Priem, author of 8 Degrees of Ingredients. Sprinkle the veal cutlets with slat and pepper. Dredge each slice in potato flour and shake off the excess. Heat the grapeseed oil in a heavy large skillet over medium-high heat. Add the veal cutlets and cook until golden brown, about 2 minutes per side. Transfer the veal to a plate and cover with foil. Add the garlic to the skillet and saute until fragrant, about 1 minute. If necessary, add another tablespoon of oil. Add the mushrooms and saute until tender, about 3 to 5 minutes. or until liquid reduces by about half. Meanwhile, whisk the tapioca starch into the beef stock until dissolved. Add to the skillet and continue to simmer until sauce begins to thicken. the veal is heated through, about 1 to 2 minutes. To serve, place a piece of veal on a plate and spoon the sauce over the veal. Garnish with a sprig of fresh parsley. This recipe calls for two different starches, potato and tapioca. The potato flour (starch) gives the veal a rich, golden brown flavor while maintaining the tenderness of the dish. The tapioca starch is a great thickener to use to enhance this sauce as it maintains a clear consistency, adding to the elegance of the dish. The potato flour (starch) can be used in lieu of the tapioca in step 4 if you desire a thicker sauce with a creamier texture.